Albecete is the most south eastern province of the region, lying just over halfway between Madrid and the Costa Blanca coast. 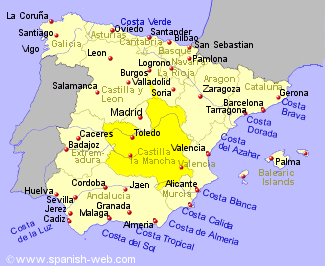 Ciudad Real lies due south of Madrid, approximately halfway between the capital and the Costa Tropical coast. The province boasts 2 National Parks, the Cabaneros National Park and the Tablas de Daimiel National Park, both important birdwatchers paradises. The large of province of Cuenca lies between Madrid and Valencia with a landscape of mountains to the north, and plains to the south. Toledo is situated immediately south of the Madrid region and is known for it's windmills, and is the setting for Cevantes "Don Quijote". The city of Toledo is also capital of the region and has an important cultural and architectural heritage, although the city of Talavera de la Reina has a larger population. Guadalajara province lies due east of Madrid with the end of the Guadarrama mountain range running along its northern border. A third of the provinces population live in the city of Guadalajara while the countryside has a lot of very small villages. There is a rolling landscape to the south, and mountains to the north.